On 20th May, the Indian summer monsoon will begin to envelop the country in two great wet arms, one coming from the east, the other from the west. They are united over central India around 10th July, a date that can be calculated within seven or eight days. Alexander Frater aims to follow the monsoon, staying sometimes behind it, sometimes in front of it, and everywhere watching the impact of this extraordinary phenomenon. During the anxious period of waiting, the weather forecaster is king, consulted by pie-crested cockatoos, and a joyful period ensues: there is a period of promiscuity, and scandals proliferate. Frater's journey takes him to Bangkok and the cowboy town on the Thai-Malaysian border to Rangoon and Akyab in Burma (where the front funnels up between the mountains and the sea). His fascinating narrative reveals the exotic, often startling, discoveries of an ambitious and irresistibly romantic adventurer. 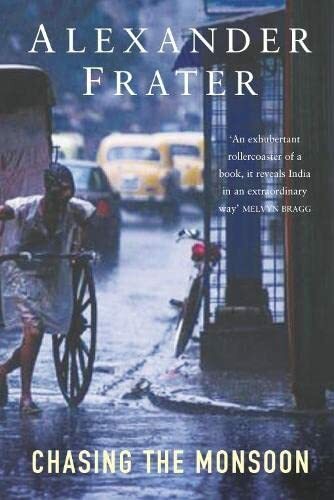 The fascinating and revealing story of Frater's journey through India in pursuit of the astonishing Indian summer monsoon.